Combo Packs. Neon and LED Car light packages. SAVE upto 35% off Retail by selecting one of our LED/Neon Combo packs! Below, you will find a few of our best LED & Neon car lighting combination packages. All Packages come with necessary installation instructions and hardware. Simply click on the Package below you wish to learn more about and you will be taken to that page. 1x 2.1 Million Color changing LED under car kit. 1x Color changing LED Wheel Well kit. 1x 10" color changing LED Glostix tube. 1x 2.1M color Digital Control Box. 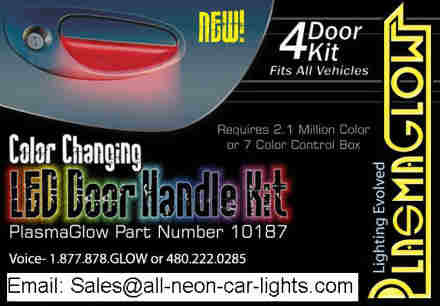 In order to operate the LED Door Handle kit, the package includes a digital control box. You can choose ANY size Glostix with this package. In order to operate the Glostix, the package includes a digital control box. Combo Packs- Back to Home Page.